The latest installation at Materials and Applications had its formal reception this weekend. 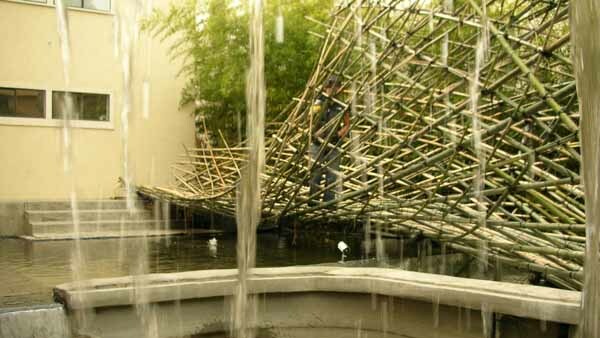 Although the Bamboo Bridge has been present for a week or two, this was the first time many people creaked their way across the bridge over a pool filled with bubbling fountains, and a rubber boot wearing D.J. The information at Materials & Applications promises that this monster will continue to grow, and evolve during the course of its residency. I am already impressed by the excellent use of zip ties to lash together the bamboo.